Even as The Walking Dead strays more and more from its source material, Robert Kirkman’s comic books could hint at what’s ahead when navigating the looming departure of Michonne (Danai Gurira). In the books, Michonne vanishes for a time during a two-year time skip that followed the defeat and imprisonment of Savior leader Negan. 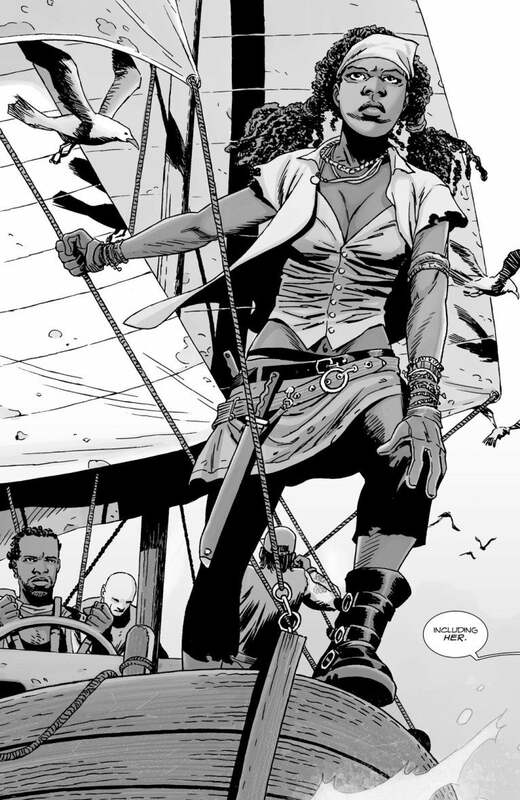 She later resurfaces in The Walking Dead #139 as a sort of pirate fisherman working with Oceanside, returning by ship during the general time period now being explored on the television series. Michonne tells Rick her attempt at domestic life with King Ezekiel didn’t work out before admitting she abandoned her two daughters when her pre-apocalypse marriage to husband Dominic crumbled as her promising career at a law firm flourished. When the world was toppled by a zombie plague, Michonne was unable to reconnect with her estranged family and presumed her daughters dead. Her shame proved so overwhelming she felt guilty for getting a “do-over” while outliving her daughters. After Rick tells her to allow herself a happiness and to go home, Michonne is later tragically unable to reunite with Ezekiel: the Kingdom leader is among the first victims slain by new territorial enemy group the Whisperers. After the Whisperer war, Michonne, Eugene, Siddiq and newcomers Magna and Yumiko embark on a course towards Ohio to connect with Eugene’s radio contact Stephanie, who claims to reside in a sizable community free of violence. Michonne’s caravan is intercepted at gunpoint by more than a dozen armored soldiers and brought to the Commonwealth, a luxurious settlement in Ohio home to more than 50,000 survivors. 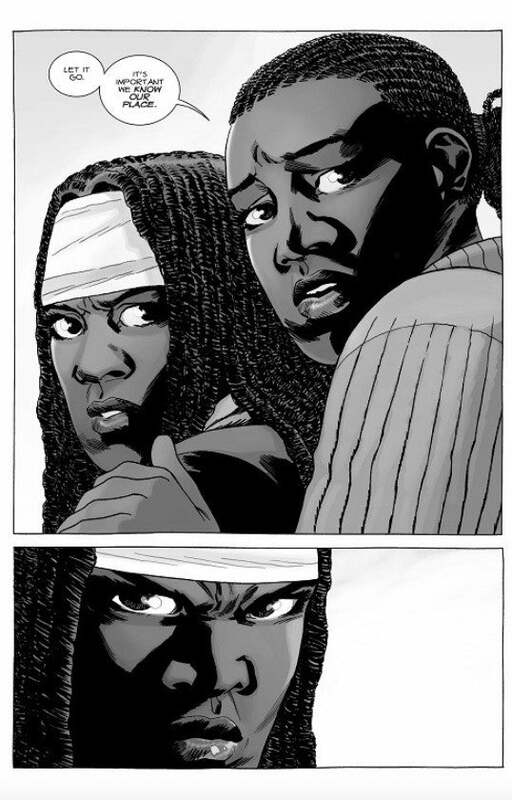 It’s there Michonne reunites with believed-dead daughter Elodie, now a young teen who reports her younger sister, Colette, was killed sometime after Dominic. The group comes to learn the Commonwealth operates on a class system, sorting survivors into “high” and “low” class on the basis of positions they held before the apocalypse. Though initially distrustful of the settlement, Michonne elects to remain with the Commonwealth to stay with her daughter, who she vows to never leave again. After she’s reinstated as a lawyer and tasked with defending police officers accused of brutality during a court hearing, Michonne welcomes her new life and becomes a vehement defender of the Commonwealth. Rick, who sees potential in the Commonwealth and hopes to avoid another war following the bloody conflicts with the Saviors and then the Whisperers, is later forced to kill close ally Dwight to defend its governor, Pamela Milton. Michonne clashes with Rick after he learns she facilitated Milton’s surprise appearance at the secret meeting, where Dwight — who had been stoking the flames of revolution — pulled a gun on Milton, who Dwight argued was a “dictator” and no better than Negan. Rick and Michonne now fear Commonwealth is on the verge of a civil war following growing sentiments of civil unrest. Gurira’s Michonne differs wildly from her comic book counterpart: in the show, Michonne previously suffered the death of a young son, Andre Anthony, and is now the leader of Alexandria and dutiful mother to Judith (Cailey Fleming) and RJ (Antony Azor). The family was left behind after the believed death of patriarch Rick (Andrew Lincoln), who was secretly flown away by Anne (Pollyanna McIntosh) aboard a helicopter after his apparent death in a bridge explosion. Gurira will appear in just a handful of episodes interspersed throughout The Walking Dead Season Ten, which could segue Michonne into the previously announced trilogy of television movies to be led by Lincoln’s Rick. And like Rick and Maggie (Lauren Cohan) before her, Michonne is better written off than killed off. Could the Commonwealth be the key to handling Michonne’s limited appearances next season? “Obviously the Commonwealth does mean things to people; we’re starting to seed in some future stories,” showrunner Angela Kang said in September. Though Gurira’s Michonne has little in common with her comic book counterpart, The Walking Dead is no stranger to molding its source material to better fit the continuity established in the show. Three major deviations — first the death of Carl Grimes (Chandler Riggs) and then the exits of Rick and Maggie — have forced The Walking Dead to carve its own, new path forward. It will have to do so again when Gurira departs. The Walking Dead Season Nine resumes on Sunday with new episodes. Season Ten arrives in October.